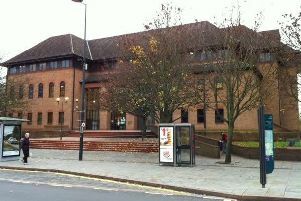 A man has been ordered to pay £245 after he kicked and damaged the door at a woman’s home after a boozing session. Chesterfield magistrates’ court heard on Wednesday, April 25, how Graham Shevrin, 26, of Gladstone Avenue, at Blackwell, in Alfreton, damaged the door at a property on Sherwood Street, Bolsover. Prosecuting solicitor Neil Hollett said the defendant and others had been drinking at the complainant’s home before Shevrin left but later returned and ended-up kicking and banging at the door to be let in. The defendant and the complainant’s partner left later, according to Mr Hollett, but when they returned Shevrin believed they had been locked out so he began kicking and banging on the complainant’s door. Shevrin told police he had been drinking and had left the home in the early hours to walk a dog and recalls not being let back in and he accepted he must have damaged the door. He pleaded guilty to causing damage to the door after the incident on March 31. He also admitted committing the offence while he was still subject to a suspended sentence order which had been imposed for failing to give details after a traffic accident, failing to report the accident and for dangerous driving. Defence solicitor Steve Brint said Shevrin fully accepts kicking the door as a result of having too much to drink but he immediately apologised and made arrangements for repairs. Magistrates fined Shevrin £130 and he must pay a £30 victim surcharge and £85 costs.